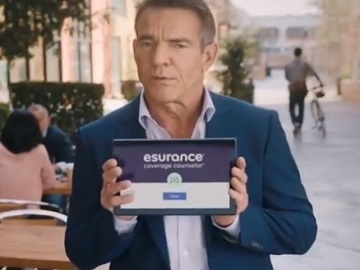 Dennis Quaid tells people that Esurance is on a mission to make insurance “surprisingly painless”. The 64-year-old actor, recently named Esurance’s new spokesman, stars in a new TV commercial for the insurance company, highlighting that Esurance are making insurance simple, easy to use and affordable. “Hi there. This is a commercial about insurance. I know you’re thinking ‘I don’t want to hear about insurance’ cause let’s be honest – nobody likes dealing with insurance. That’s why Esurance hired me, Dennis Quaid, as their spokesperson because apparently I’m “highly likeable’ and they want me to let you know that they’re on a mission to make insurance painless,” Quaid says as he goes from a TV ad on screen to a viewer’s couch and then to a street, where a woman says she likes Dennis Quaid and picks up the newspaper that he had dropped to give it back to him. He continues his speech in another part of the city, walking near a coffee shop where one of the customers reveals he has no idea what he’s getting. Quaid mentions this is the reason why Esurance are making insurance simple – “so that even actors, like us, can understand it.” He then says Esurance are making it easy to use and affordable. “Now you might not believe any of this since this is a television commercial,” he also says, mentioning that Esurance are also “being so transparent about all this.” The end of the ad sees Quaid walking off and doing a “very dramatic sunset to reveal the new Esurance tagline so that you’ll remember it”, namely “surprisingly painless”. This ad marks Quaid’s TV commercial debut. He has thus become the first on-camera spokesperson for Esurance, a company whose competitors tapped celebrities to pitch their products and services.